Associate dean for Simulation Programs inducted as SSH Academy Fellow at International Meeting for Simulation Healthcare. 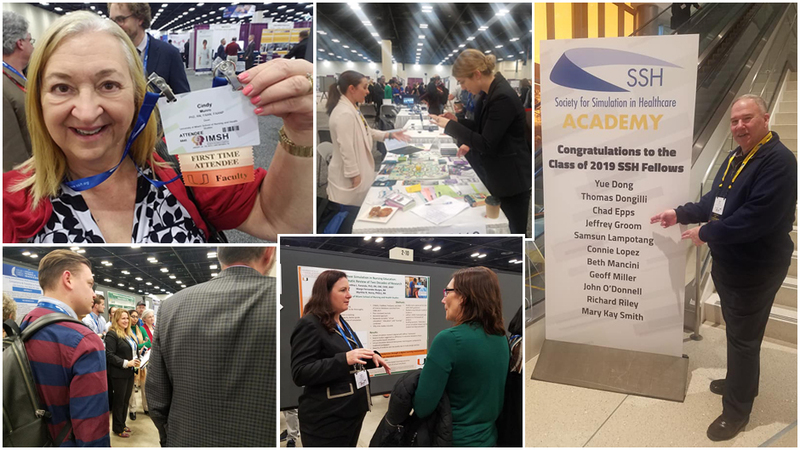 The School of Nursing and Health Studies had a strong presence at the 2019 International Meeting for Simulation Healthcare (IMSH), “Redefining & Redesigning Healthcare Powered by Simulation.” Dean Cindy L. Munro was excited to be a first-time attendee of the conference, which was presented by the Society for Simulation in Healthcare (SSH) from January 26 to 30 in San Antonio, Texas. During the meeting, Dr. Jeffrey Groom, professor of clinical and associate dean for Simulation Programs and the International Academy for Clinical Simulation and Research, was inducted as an SSH Academy Fellow with the Class of 2019. Groom is one of the first two certified registered nurse anesthetists ever named to the SSH Academy, which convenes a peer-vetted cadre of experts initiating important work to advance the field. Academy membership is based on outstanding and sustained contributions to the development of the SSH, the field of healthcare simulation, and the academy’s mission and vision to improve performance and reduce errors in patient care through the use of simulation.